By Zhang. Posted 2008-12-03 at 19:26. Filed under Electronica and tagged Japan, United Kingdom. Permalink. Subscribe to this post’s comments. Both comments and trackbacks are currently closed. Ian Hawgood, international man of mystery. Mr. Hawgood is a hard-working musician, with an impressive oeuvre spread over a dozen of quality record labels. While his Koen Park moniker is about IDM- and Hip Hop influenced Electronica, the music he publishes under his civil name can roughly be classified as Ambient, Drone and Noise. His “The Fires Will Die At Night” at Resting Bell Netlabel is legend already. For 12rec., Ian Hawgood delivers an album completely recorded with analog instruments. His most subtle and personal up to date. 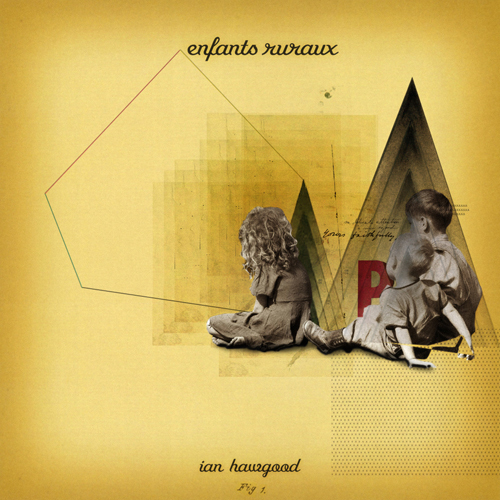 As the title depicts it, “Enfants Ruraux” is a journey into his childhood when little Ian was nearly deaf; he got obsessed by simple tones and melodies in these days. On the one hand, “Enfants Ruraux” is a meditation on the elementary sound of the piano and the acoustic guitar. Hawgood is happy to be blessed with a musical family and circle of friends who lent pump organ, chimes, violins, trumpets and loads of other stuff for further investigation. On the other hand, the album deals with various aspects of traveling. UK-born, Ian Hawgood lives in Tokyo right now but that was able to call Spain, Italy and the US home before. Most of the album was made in Pennsylvania and on trains to and from New York City. Throughout the blissful layers of acoustic textures, field-recordings reverberate and bring forth impressions from all these different places. Especially the mystical Japanes countryside was inspiration to Ian while recording this twinkling masterpiece of calm Ambient music. Planet Terror Records: An exciting release for us since it’s our first by an outside producer.